New book, 380 pages. This book is a resource on holistic veterinary care written specifically for the veterinary technician. Organized by treatment modality, the book offers practical information designed to help readers develop an understanding of each modality, assist with procedures associated with holistic medicine, and knowledgeably discuss treatment options with clients. Outlining the respective roles of technicians and veterinarians throughout, "Complementary Medicine for Veterinary Technicians and Nurses" provides thorough coverage of integrative veterinary medicine in a user-friendly, digestible format. A range of common and lesser-known modalities are covered, including physical therapy, holistic nutrition, acupuncture, chiropractic, Chinese, Western, and Ayurvedic herbal medicine, homotoxicology, homeopathy, aromatherapy, and grief counseling. 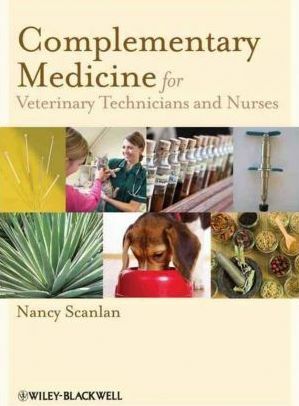 This book is a welcome reference for both technicians and veterinarians looking to expand their knowledge of complementary veterinary medicine and introduce additional treatment options in their practice. Key features: Offers complementary veterinary medicine information designed specifically for veterinary technicians and nurses; Clearly defines the scope of the technician's role in complementary medicine; Covers both common and lesser-known holistic modalities Includes historical background, step-by-step procedure guidelines, and practical tips for client communication for each modality; Aids technicians in confidently and competently discussing alternative medicine treatment options with clients; Provides clinically-relevant patient history and release forms, glossary of terms, quick reference charts and contact information for additional resources and training.